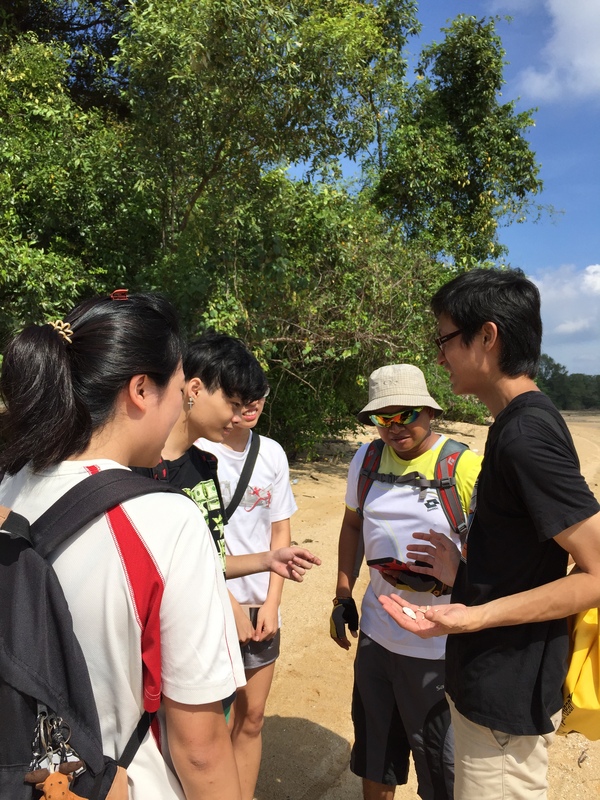 The Earth Day Coastal Cleanup recce @ Pasir Ris Beach 6 – welcoming new volunteers! 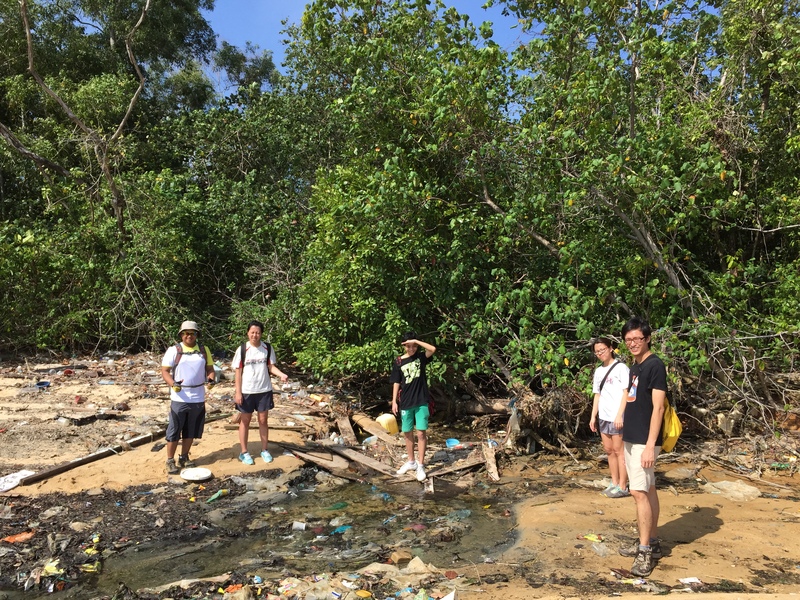 12 Apr 2015 – NE Zone Captain Yi Yong and ICCS Intern Becky Lee welcomed four new ICCS Otters to our Earth Day recce at Pasir Ris Beach 6. These volunteers responded to the call for new volunteers issued in early March, and attended our our first meeting on 20 Mar 2015 to learn more about what we do in ICCS. On the recce, they learnt about evaluating the trash load, identifying trash collection and disposal points and working out the risk and safety issues. It also gave us an opportunity focus to get to know each other better! Our new Otters! From left: Maludin (Deputy South Zone Captain), Elizabeth (Site Buddy), Hung (East Coast Zone Site Buddy), Fanghui (Site Buddy), with Yi Yong, our Northeast Zone Captain on the far right. Everyone was shocked by the amount of accumulated plastic, especially on the far end of the beach and on the high strandline. 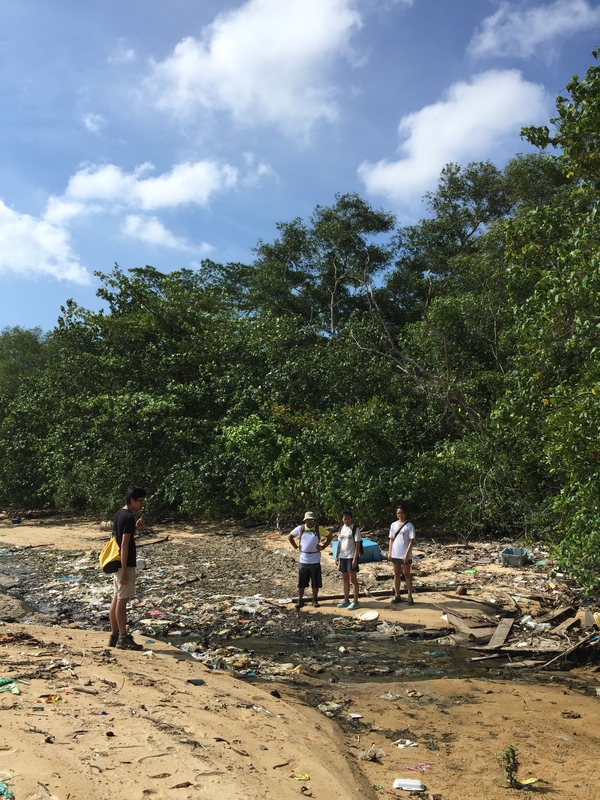 As we walked the 350m stretch of beach, Yi Yong shared his experiences of working this beach over the years and talked about many layers of trash that was still buried underneath the sand we were walking on. During the monsoon, high tide bring in higher amounts of flotsam which is dominated by plastic, styrofoam, and wood with sharp protruding nails. In recreational beaches such as East Coast Park, trash is cleared daily by NEA workers below the strand line and sometimes twice daily! Above the strand line in these parks, NParks has workers tending to the cleanliness of our beaches. This is the reason why Singaporeans enjoy clean beaches! 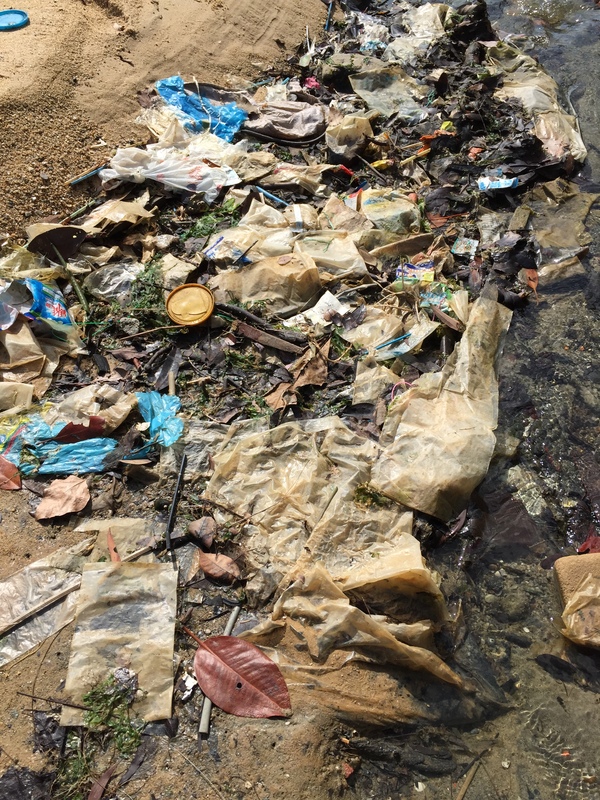 However Pasir Ris Beach 6 lies beyond the Pasir Ris Park area, so trash accumulates. This affects beaches around the world, even seemingly pristine tourist destinations such as Phuket. 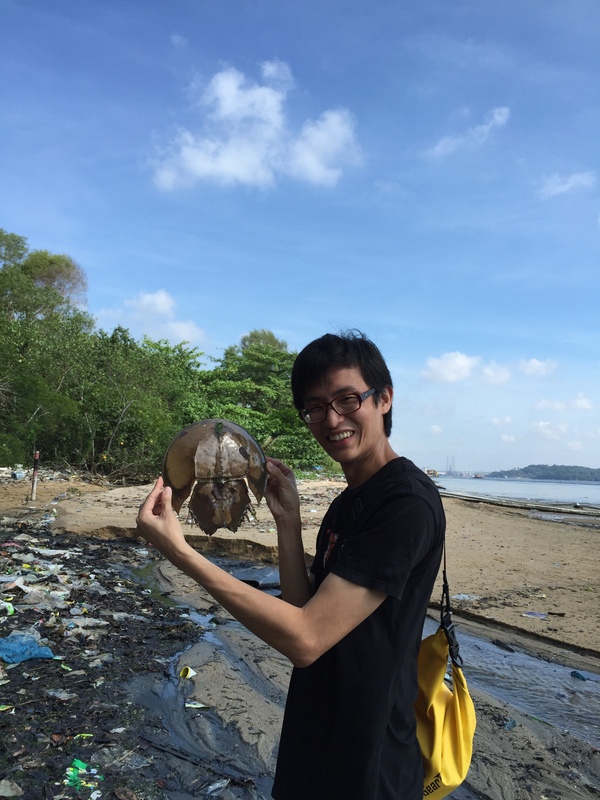 Amidst the trash of Pasir Ris Beach 6, marine life still persists. We were struck by the appearance of numerous horseshoe crab moults. These animals come form a line which has been present on the planet for more than 445 million years! Only four species are present worldwide and we are lucky to have two on our shores, the mangrove horseshoe crab (Carcinoscorpius rotundicauda) and the coastal horseshoe crab (Tachypleus gigas). Seeing the moults on the beach are a reminder of the life our coastlines still do hold despite all that trash. This is an important part of our motivation for the cleanups – we want to make our shorelines a more habitable environment for marine life! The recce not only familiarised our new volunteers with examples of local biodiversity, but the beach itself. This is an important part of an organiser’s preparation for conducting a coastal cleanup. On 18 Apr 2015, the Earth Day Coastal Cleanup was conducted with rousing success! Thank you Maludin, Elizabeth, Fanghui and Hung for assisting the ICCS’ Earth Day operations, and we look forward to working with you all together as ICCS Otters! This entry was posted in iccs otters, pasir ris, recce, volunteer. Bookmark the permalink. ← The first ICCS Volunteers’ Meeting 2015 – encouraged by new and experienced volunteers!